Holiday parties are truly a time to shine. It's there that you see distant family members, friends, loved ones, or maybe even a special someone you have your eye on. In any event, you've got to make sure your look is on point. While a full-on makeup appointment and brand-new hairdo aren't always feasible for the many parties you're sure to attend this season, we think it makes the most sense to master your own style at home to save some dinero and still look flawless. For ladies with curly, natural hair, it may seem a little scary trying rock a Janelle Monae-esque 'do, but we're here to tell you it's time to start giving yourself more credit! Take a look at these gorgeous natural updos (that you can create yourself!) below! Headbands are the easiest way to accessorize an updo, whether its messy-chic or full-on glam. We love this curly ponytail on Anika Noni Rose with a simple glitzy headband. Corinne Bailey Rae's curly, piled-up do is so simple yet so stunning. To keep curls intact and frizz free, try SheaMoisture Coconut & Hibiscus Curl-Enhancing Smoothie ($12). Ever the slayer of the pompadour, Janelle Monae looks incredible in a chic front-pouf, but switched up the classic look with a pinned-up braid. To keep flyaways at bay for a perfectly sleek braid, try Andre Walker Hair Get It Styling Creme ($22). We're convinced Rihanna's hair can do no wrong. This style is great for when you're looking to rock a more laid-back look at your holiday party. To get a super-high pony like RiRi's, try placing in a few vertical bobby pins on the underside of the ponytail to lift the hair tie. Really though, how gorgeous is this oversized braided bun on Teyonah Parris? Great for women with full, long locks, this wrap-around braid is the perfect (simple) look to wow fellow party-goers. We can't get over this pseudo–faux hawk on YaYa DaCosta. We recommend reverting back to the '90s: pull hair taught with a banana clip (like the Karina Black Banana Clip, $7) and let your curls fall effortlessly out. 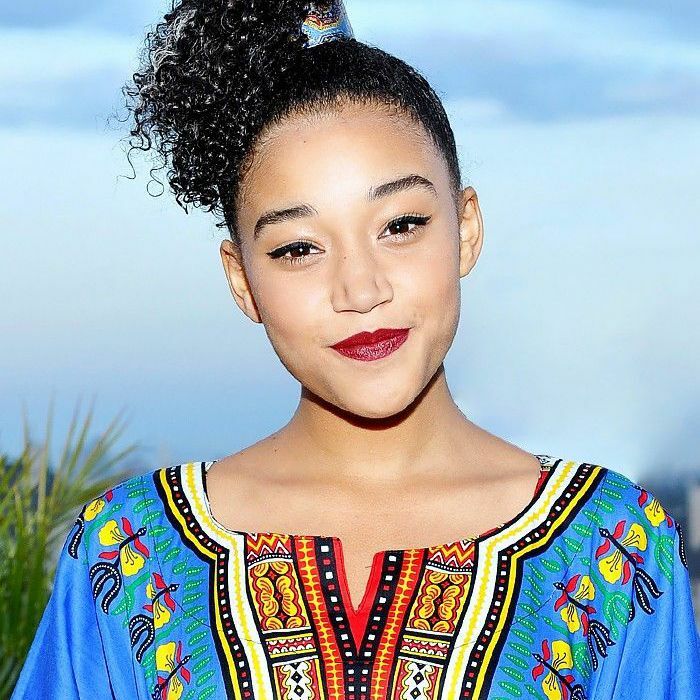 This side-swept pony on Amandla Stenberg is made perfect with a cuff ponytail holder. For some holiday gilded glam, try the L. Erikson Cuff Ponytail Holder ($22) in silver or gold. Which look are you dying to try this holiday season? Share your ideas with us in the comments!